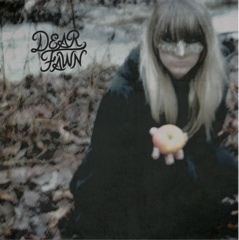 Dayton indie rock band Dear Fawn just released their new EP, I Played The Queen, this week on Dayton imprint Gas Daddy Go! Records. The band is led by the stunning vocals and songwriting of Tifani Tanaka and rounded out by King Elk members Kyle Melton, Andy Smith and Tyler Bellingar. Unlike King Elk’s 50’s and 60’s inspired psych-pop, the more experimental Dear Fawn create a darker, grittier punk and New Wave infused garage rock sound that recalls the grimy swagger of The Dead Weather. A cascading classic rock-like guitar melody dissolves into a twisty surf-rock riff on the opener, “The Bad Seed” which also provides the introduction to Tifani’s smoky, blues-soaked croon. Standout track, “Bandwagon” follows and settles into a stomping groove with buzzing keyboards and a rumbling bass line along with welcoming lyrics that contrast nicely with the menacing music. The first single, “There Are Tigers In The Basement” also stands out with a hip-shaking rhythm, soaring vocals and some catchy 60’s girl group melodies. The title track, “I Played The Queen” is highlighted by a slinky, danceable rhythm and Tifani’s soulful vocals. “You’re a Noose” is led by a warbling and bouncy New Wave-like keyboard melody and “Not In The Lionhearted Room” is built upon snaking guitar lines that curl and creep around the infectious vocal melody. Closing out the seven-song EP is the super-charged “White Russian” with its crunchy 90’s-style guitar riff, thrashing drums, stop/start rhythm and the psych-rock guitar freakout that ends the song and the EP on a high note. I Played The Queen, the very promising debut EP from Dear Fawn is available now on a limited run of CDs and as a digital download via the Gas Daddy Go! Bandcamp page and it provides further proof of the Gem City’s excellent musical talent. Fourth Of July - "Empty Moon"